In the C4I domain, the IdZ-ES Testing phase is also being used as a piloting programme for the Bundeswehr’s new Battle Management System, FührungsInformations-System des Heeres (FüInfoSyS H). As a consequence, Dr. Rippert explained that IdZ-ES’ development testing phase included assessment of interfaces with different Armoured Vehicles with IdZ having a ‘hook’ into the BMS. “This is something quite new. Never before have our soldiers been connected to a BMS on platoon level and below via data and voice. In regards to the IdZ Basic System, already in service, Dr. Rippert explained that the number of ten-man systems, fielded will remain at 938. The final number of IdZ-ES systems has yet to be determined, although, Dr. Rippert expects the first series to be, “only a few hundred.” He continued, “In 2009 we will begin risk reduction and finalisation for series production and then we will decide how many items we will buy for the first series.” There is no clear outcome on which unit will receive the systems first although previously the first systems were issued to parachute troops. The Basic System was deployed to Kunduz, Afghanistan after fielding, as part of a rotation of German troops to Afghanistan for a five week period in early 2005. As part of the IdZ-ES test, no new ensembles will be deployed as part of the International Security Assistance Force. Desert testing for IdZ ES has already taken place in the US at Fort Bliss, Texas. At the other end of the scale, in late 2008 winter testing began in Germany’s Alpine region. 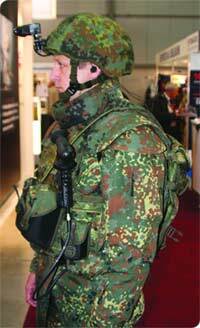 Germany has a number of large scale specialist units including Mountain, Airborne and Airmobile units which will be equipped with the IdZ-ES system. Besides the combat infantryman and associated front line support units, Germany has a much more expansive requirement for soldier modernisation under the heading of the programme Soldatim Einsatz (SIE).